Manila, 20 March 2019 — Half a century ago, managers first learned about situational leadership. It’s time to adapt that model for use in our world today. In the late sixties, Hersey and Blanchard introduced a leadership model that was considered revolutionary at that time. The world operated on a paradigm of leaders and followers, and most of the world’s businesses and companies were run through directive top-down hierarchies. In this context, Hersey and Blanchard’s Situational Leadership model recommended that managers choose between four behaviors for how to interact with their followers (staff). The correct choice, they were advised, would depend on the abilities and the willingness of their followers for the task at hand. Depending on the abilities and willingness being low or high, the model offered a linear progression of choices, from Telling and Selling to Participating and Delegating. More than a generation of managers (and consultants advising those managers) have used this model, which is still in mainstream use today. Meanwhile, our world has changed radically since the model was introduced in the late 1960s, and so have the opportunities that managers have today. Technology has disrupted and enabled the way we work in fundamental ways. New worldviews have emerged in our societies. We find ourselves in a 21st-century leadership revolution that changes the game for both individual and collaborative leadership. I believe therefore that it is time that we revisit the model. Building on Hersey and Blanchard’s original work, I offer an altered version of their behaviors matrix below, with the horizontal axis changed from Directing to Enabling and now without their familiar arrow of linear progression which I believe no longer applies universally. The choice of four behaviors remains, with some modifications in the descriptions to suit the workplace conditions of our time. They are shown in the diagram below: with Blue for Directing, Orange for Supporting, Green for Coaching, and Yellow for Delegating. For the meaning of the colors, please refer to the Work In All Colors method. 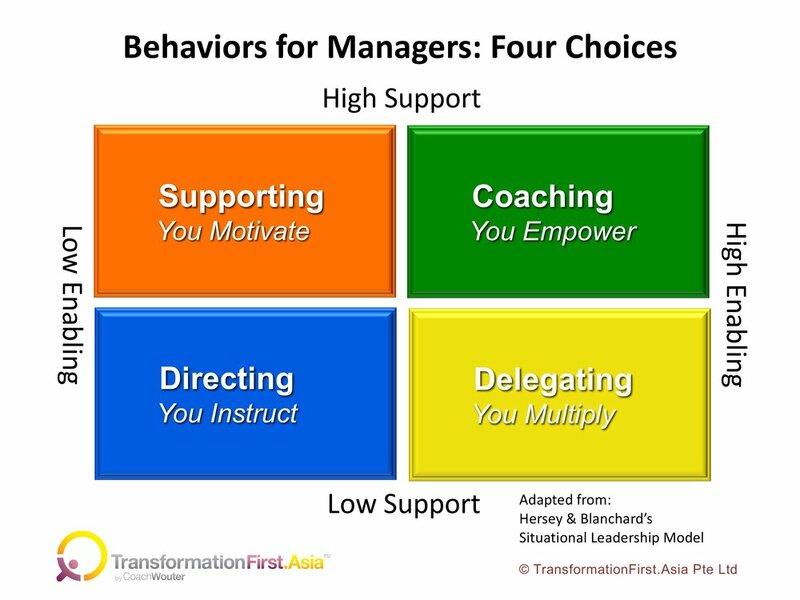 Additionally, as pointed out by De Ruiter in his seminal work Driven by Dialogue (2018), there are at least two other choices available to managers today for situations that occur less frequently, where Red or Purple behaviors are likely to be more effective. So what are the four choices about? In this behavior, managers give specific and detailed instructions on what, when, who, and how actions should be taken. Giving instructions is a low-support and low-enabling behavior. This behavior was more widespread in the late 1960s and its effectiveness is questioned more often today, especially among Millennials. Of course, there are still many situations today where instructions and compliance checks are appropriate. Think, for example, of the legal, banking, transport, and security sectors. Even there, however, other behaviors are being introduced. In this behavior, managers motivate their staff to take action and give their active support to get going. This is a high-support and low-enabling behavior. Hersey and Blanchard referred to this behavior as selling. With more attention being given today to the values and purpose behind actions, the earlier selling behavior is often regarded as less appropriate today, to be replaced by a more encompassing behavior of giving active support, and motivating staff to take responsibility. In this behavior, managers make themselves available to coach their staff through the process of preparing and implementing actions. The empowering quality of coaching makes this a high-support and high-enabling behavior. With skillful coaching, this can go way beyond Hersey and Blanchard’s original concept of participation. Coaching—and its sister mentoring—are increasingly in demand as popular and effective ways for working with Millennials in the workplace. Since the 1990s, we have seen an explosion of coaching around the world, as an effective way of improving performance in today’s workplaces. In this behavior, managers allow their staff to take charge of the actions, and largely ‘get out of their way.’ With its potential to enable an outscaling of actions to multiply and have more impact, it is a low-support and high-enabling behavior. Increasingly, delegating behaviors can be supported by having smart technologies in place for monitoring entire processes from preparation through to results. Increasingly, this will reduce the need for widespread personal interventions by managers in the work of their staff. As a manager, what choices do you make in the various situations you face with staff under your responsibility? Do you observe any shifts? Which behavior do you use most?